Young Scientists Networking Conference on Food Futures, sponsored by ICSU, ISSC, and DFG under the umbrella of Future Earth. With Jonathan Seaquist, I co-supervise two PhD students who focus on quantifying the trends of growing crops on land owned by foreign investors (large-scale land acquisitions, sometimes called "land grabs"), and their social and environmental impacts. With Emma Li Johansson, we have used network analysis to identify the key land traders and their roles, and crop modeling to estimate the water demand for crops currently in production on such land in Africa- see below. With Altaaf Mechiche-Alami, we are analyzing the temporal trends in land ownership, and implications for food security. 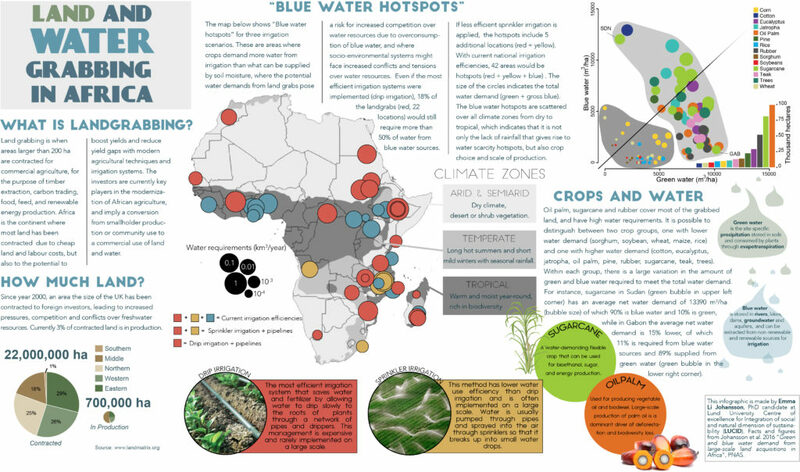 Infographic summarizing our analysis of water use by large-scale land acquisitions in Africa. Link to the full paper in PNAS. For the first time, researchers point to areas in Africa where foreign agricultural companies’ choice of crops and management of fresh water are partly responsible for the increased water shortages and greater competition for water. This in turn increases the risk of outright conflicts between all those who need water – plants, animals and humans. During the 21st century, foreign companies have leased large tracts of land in Africa – more so than in other parts of the world – in order to produce cheap food, cheap timber and cheap raw material for biofuels. An interdisciplinary study from Lund University in Sweden shows that about three per cent of the land leased in Africa by foreign companies has been registered as currently in production, for the purpose of growing crops. For various reasons, the companies have either pulled out or not started producing on other leased land. The study also shows that the crops that foreign investors decide to grow often require more water than the traditionally grown crops. Furthermore, it shows that the same crop can have very different needs for water, depending on the climate where it is grown and which irrigation systems the companies use. The researchers in Lund, together with a colleague in France, have developed a model that shows how much water is needed for different production systems, in different types of climates, in different parts of the continent. The model takes into account both the size of the land and the type of irrigation system. This model has enabled researchers to distinguish between areas where rainwater accounts for the largest share of irrigation water, and areas where large foreign agricultural companies satisfy more than half of their water needs by using fresh water sources, such as groundwater, rivers and ponds. This has allowed the researchers to highlight the areas around the continent where increased competition for water escalates the risk of water-related conflicts between different sectors and ecosystems. “These hotspots have not been identified in this way before. 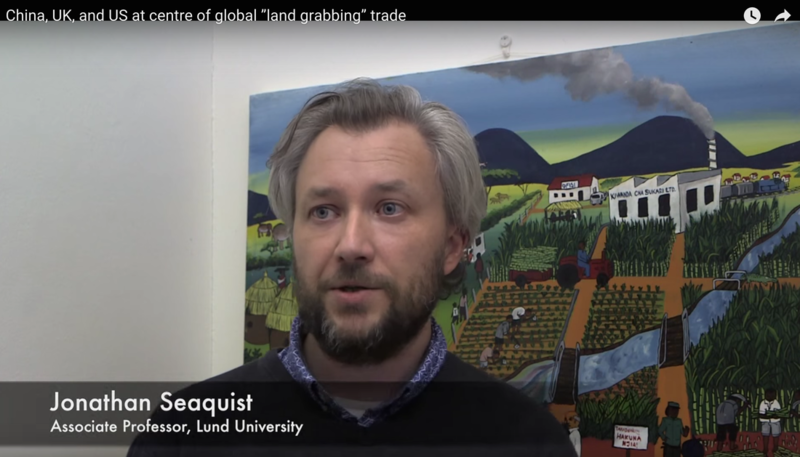 Previous studies have often focused on the size of the area and not on how much fresh water is used to grow the demanding crops that foreign companies are interested in”, says physical geographer Emma Li Johansson, who was in charge of the study. The leases are often written for periods of 33 to 99 years. The contracts rarely include any rules or limits concerning the use of water. “Our research can perhaps lead to foreign investors showing greater consideration for how much water is necessary, in relation to how much water is actually available. Hopefully, the results can serve as a basis for documents that regulate the water consumption of large-scale farming companies”, says Emma Li Johansson. Nearly two out of three countries in the world today participate in a new kind of “virtual land trade,” where not only the goods produced but land ownership itself is traded internationally. This was the finding of our study, published 7 November 2014. One-third of countries both import and export land ownership. Of the 80 countries that export land ownership, most export to only a handful of trading partners, with a third having just one import partner. On the other hand, Ethiopia exports land to 21 different countries, and the Philippines and Madagascar both export land to 18 countries. Figure 1. The top 20 countries in the global land trade network, ordered by the largest number of trading partners. 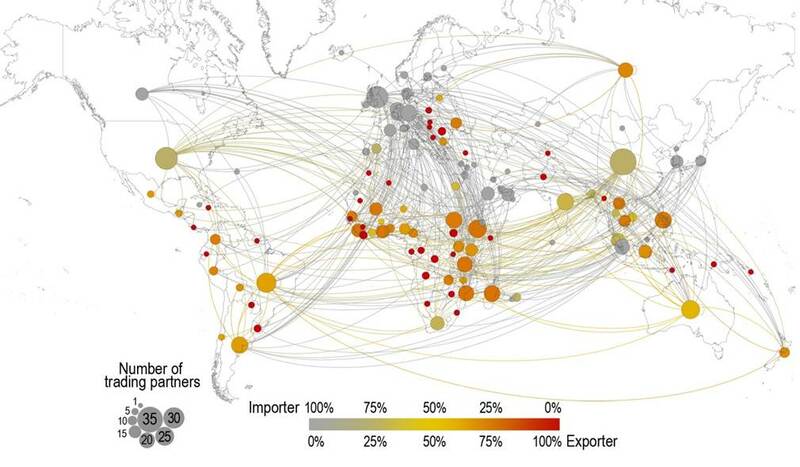 The list is also partitioned by number of import partners (gray bars) and number of export partners (red bars). Geographically, countries in the global North primarily act as land importers, while the global South acts primarily as land exporters (Figure 2). There are four main areas that import land: North America, Western Europe, the Middle East, and developing economies in Asia. Southeast Asia is also an exporter of land, along with South America, Eastern Europe, and especially Africa. Many of the areas exporting land currently have low agricultural productivity, so have potential to boost yields with technological improvements. Figure 2. Map of the land trading network. The color of the node shows to what extent a country is an importer (gray) or an exporter of land (red), and the size of the node represents the number of trading partners. The links represent the flow of land acquired by an importer from an exporter. Link colors are that of the importing node. Number of countries (nodes) = 126, while number of land trade relationships (links) = 471 (reflexive links shown, e.g., loop for China having a national partner involved in land trade along with international partners). While overall, the web linking land trading relationships is diffuse, again China, the US, and the UK are at the center of the network of land trade. When considering the connection between countries, one of these three countries lies on the shortest connection path over a third of the time, meaning they are important in strategically connecting the network, and their policies may have far-reaching effects in distant lands. The Netherlands played a surprising role in connecting distant countries. Although it imports land from only about half as many partners as the UK, its connectivity is nearly as high, meaning that its land trading partners are strategically important. Other studies have also found the Netherlands plays a disproportionately large role in coordinating global trade, including a recent analysis of water trade, reflecting its important historical role in coordinating trade between Europe and the rest of the world. For land exporters, Ethiopia was the most central country, providing the path of shortest connection between almost 8% of the network- five times more often than the average country participating in land trading. This implies that, if importing countries become dependent on goods produced on land in Ethiopia, they might experience shortages or price hikes if there were a drought or other disruption in Ethiopia. Conversely, if countries that export land become dependent on foreign investments behind these deals, they could be vulnerable to changes in the global market or policy changes in distant lands if these investors decide to terminate their use of the land, potentially leaving problems with unsupported infrastructure and jobs, and lost land rights behind. 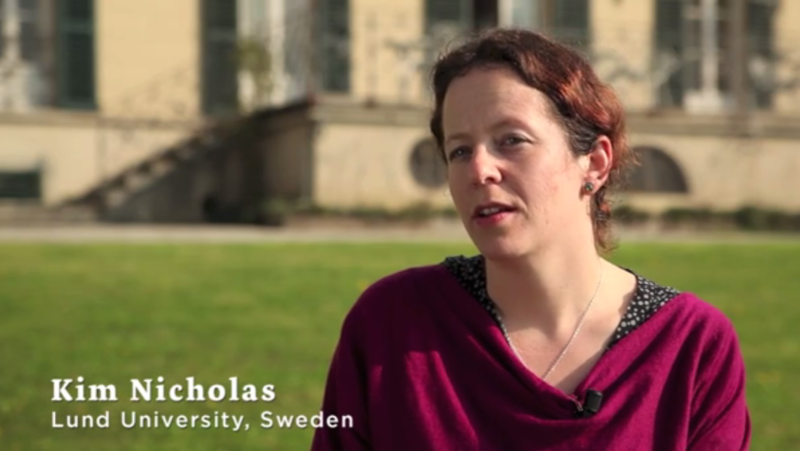 The research was led by Jonathan Seaquist, Associate Professor in the Department of Physical Geography and Ecosystem Science, with collaborators Emma Li Johansson, a PhD student in LUCID, and Kimberly Nicholas, an Associate Professor of Sustainability Science at the Lund University Centre for Sustainability Studies (LUCSUS). We used the tools of network science to analyze the most comprehensive data on land acquisition available, by combining information from two sources, the Land Matrix and GRAIN, to analyze nearly 1400 land trade deals. Network science has been used in previous studies in fields as diverse as brain function, international finance, and human migration to explore the patterns of connection between elements in a complex system. This approach has recently been adopted as a way to quantify the increasingly globalized nature of trade in natural resources such as water used for agricultural production. This work demonstrates that we live in ‘a global village’ as far as land is concerned. Decisions made on one part of the planet can affect the land productivity, biodiversity, and the well-being of people on another. A major challenge is how we can use this type of knowledge and awareness for simultaneously guaranteeing the delivery of ecosystem services, preserving nature, enhancing equity, and reducing poverty in a world undergoing rapid change. This work has been covered by media including the Washington Post, Environmental Research Web, Vox, and Reuters. ​See the Lund University press release here. Click here for a full resolution PDF of our poster. We presented an initial analysis of land grabs based on the crops they were growing, and their implications for fuel use and food security, in October 2012 at the International Institute for Applied Systems Analysis (IIASA) 40th Anniversary Conference, "Worlds Within Reach: From Science to Policy," in Laxenburg, Austria. These data were later updated by Land Matrix. Click on the image to the left for a full-resolution version of the poster. Our lab contributed to new Scientific American infographic showing international land trades.